Positive: Solid workmanship; compact size; excellent ergonomy; great display; long battery life; powerful hardware. The Asus ZenBook Flip 15 is a 2-in-1 laptop with a powerful 8th-gen Intel Core i5 processor paired with NVIDIA’s GTX 1050 GPU. It gives users all the convenience and versatility of a 360°-rotatable 15.6” display in a stunning new design. It is thin and light, featuring the 8th-gen Intel® Core i5 processor, discrete graphics, an HDD with up to 2TB + a 512GB SATA SSD, USB-C ports, and a powerful Harman/Kardon audio system. The ZenBook Flip 15 is a timelessly elegant masterpiece, exquisitely crafted from solid aluminum, giving it a tough, scratch-resistant finish that has been designed to stay beautiful. The ZenBook Flip 15 uses incredibly tough and durable alloy steel in its any-position 360° hinge mechanism. It is available in two exclusive and elegant new colors with two different textures: Pure Silver and Smoky Gray. The Flip 15 uses a standard layout chiclet keyboard with white-colored keys and white backlighting. One thing that we noticed is that it does not have the last column after the NumPad, where the “-“, “+”, and “enter” keys are usually located. The touchpad, which also serves as a click pad, is smooth on the hands and does not have much resistance when gliding on it, which is good. The ultra-sharp screen has an amazing Full-HD resolution of 1920 by 1080 with wide, 178° viewing angles, so it is always easy and comfortable to view. With an incredible pixel density and 100% sRGB coverage, images and text are always pin sharp and ultra-detailed. Furthermore, the screen has an ultra-narrow bezel. The result is a laptop with a 79% screen-to-body ratio that maximizes the screen area while minimizing overall size. To maximize the viewing comfort, the NanoEdge display also has a matte anti-glare coating which reduces annoying reflections. 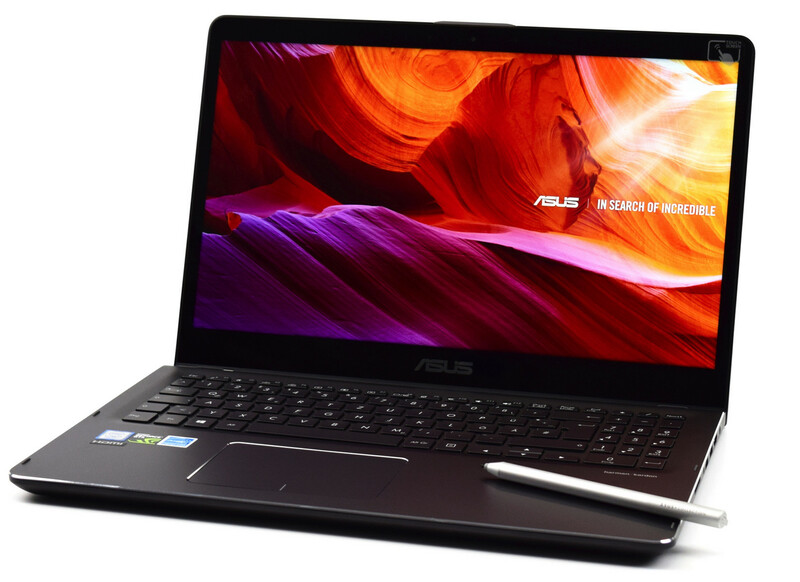 Asus ZenBooks have a history of having good color reproduction displays, which is always a plus for any user. The audio quality is loud, clear, and crisp thanks to the Harman/Kardon loudspeakers. The highs, mids, and lows are more than decent enough. The AudioWizard app lets users choose which sound type they would prefer by picking from the presets or by customizing their preferred quality. The Flip 15 is a powerful 2-in-1 ultrabook, since it features an Intel Core i5-8250U, an NVIDIA GTX 1050 (2GB), a 512GB SSD, and 8GB of RAM that is expandable up to 16GB. This kind of setup is suitable for gaming as well as photo and video editing. Whether a designer, a developer or a gamer, every user will get the best possible graphics performance with the ZenBook Flip 15. The notebook features the revolutionary USB-3.1 Type-C port for any-way-up connections and super-fast data transfers, twice faster than USB 3.0. The USB-C™ port on the ZenBook Flip 15 incorporates the latest technology for versatile, ultra-fast transmission. The Flip 15 also comes with the latest 802.11ac Wi-Fi, with speeds of up to 867 Mbps - it is three times faster than older Wi-Fi generations.